Nestled within Thaniya Plaza, FLAIR The Espresso Bar is a mere three-minute walk away from Sala Daeng BTS Station. Specialising in espresso based drinks, the coffee bar is more of a takeaway kiosk than a cafe for those who are craving for a cup of coffee to go. The coffee place’s small structure makes it easy to go unnoticed unless you are keeping a look out for it but it has been building a steady reputation through positive word-of-mouth by their loyal patrons. Those who cannot survive the day without some caffeine boost can drop by Flair The Espresso Bar for their excellent range of coffee that are mostly priced below THB65/S$2.67. Since they open from early morning during weekdays to cater to the working professionals, you are likely to see office workers flocking in for their morning cuppa. Besides their splendid brews, it is also worth mentioning that the staff is friendly and accommodating to our requests. Those who have no clue on what to get can ask the barista for her recommendations. Their hot coffee menu features Espresso in single (THB50/S$2.05) and double shots (THB60/S$2.47), Americano (THB55/S$2.26) Cappuccino (THB55/S$2.26), Caffe Latte (THB55/S$2.26) and Caffe Mocha (THB60/S$2.47). Since it was a hot day, we decided to chill with a cup of Iced Caffee Latte (THB60/S$2.47). The freshly pulled espresso was rich and full-bodied, balancing perfectly well with the creamy milk that was poured into it. We were able to taste the espresso in its true form as no sugar has been added into the beverage. Those who prefer something sweeter should inform the barista beforehand. Otherwise, you may find it too bitter for your liking. 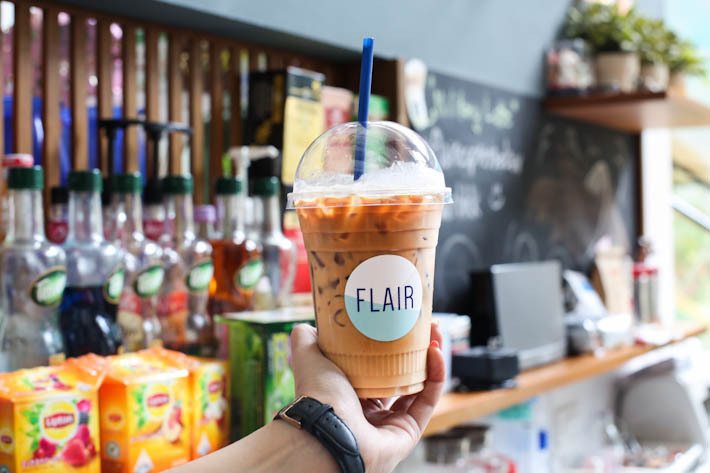 FLAIR The Espresso Bar also has non-coffee drinks including Assorted Hot Tea (THB45/S$1.85), Thai Iced Tea With Milk (THB50/S$2.05), Hot Matcha Latte (THB70/S$2.88) and Hot Cocoa (THB55/S$2.26).